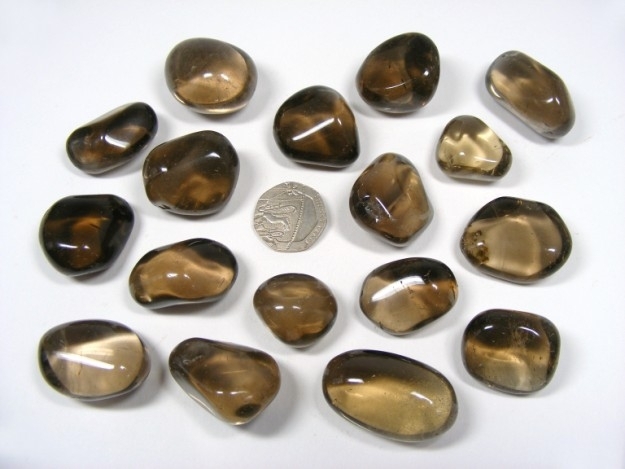 These are lovely top grade Smokey Quartz with an excellent depth of colour. Excellent for helping us to release emotional blockages and deal with stress. Do be aware that there may sometimes be very slight surface marks left by the tumbling process. Smokey Quartz is believed to help strengthen our back, reduce cramp and regulate liquids in the body. It is also thought to be beneficial in treating disorders of the abdomen, hands, feet, hips and legs. Smokey Quartz works slowly and gently over time to help us release and remove emotional blockages and to lessen or reduce our worries. It is an excellent stone for helping us to deal with stress and it also helps us to get through difficult or hard times more easily. Smokey Quartz helps to relieve fear, ease depression and also helps us if we suffer from fear of failure. It is extremely useful in helping us to let go of anything that no longer serves us. Smokey Quartz promotes a feeling of personal pride within us and helps us to enjoy the simple joy of living. Smokey Quartz is a superb grounding stone helping us to keep our feet firmly on the ground and bringing our attention to the here and now. At the same time it is also an excellent stone for meditation as it helps to raise positive vibrations during meditation. It is a protective stone that helps to generate a barrier of protective energy around the user. It can absorb and clear large amounts of negative energy and can block geopathic stress. Smokey Quartz helps to balance our Yin-Yang energy and can help to strengthen the communication links between this world and other worlds.